Saturday I was in town for some deliberate shooting. Rather then my normal strolling around to see what comes in front of my lense (as usual my favorite m.Zuiko 17mm f1,8) I set myself the goal to capture some motion in my shots. 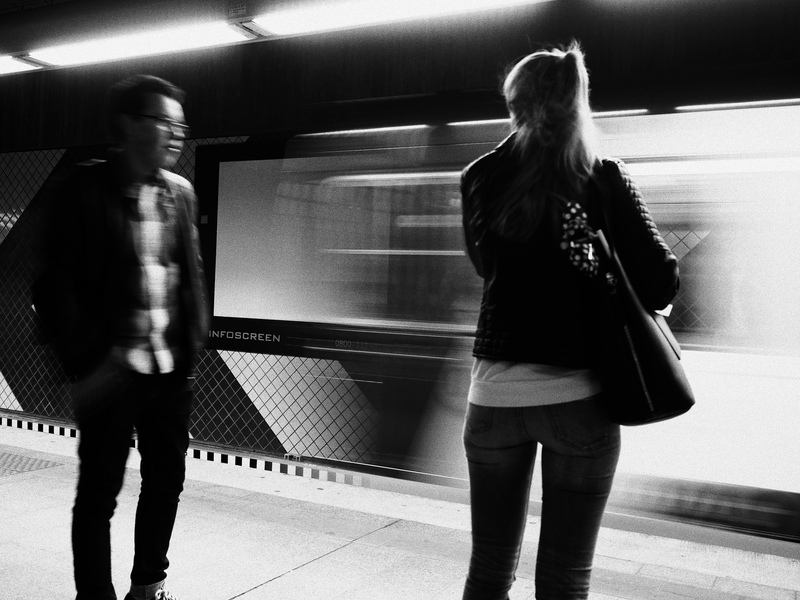 Experimenting a bit I found that 1/6 of a second is a pretty good staring point capturing people in motion to get this distinctive blur, while keeping the rest of the pic (static objects) sharp despite handholding the shots, thanks to the great 5 axis image stabilization of the PEN-F (same as in my E-M1). I started in the subway, because here you find always people in a rush. 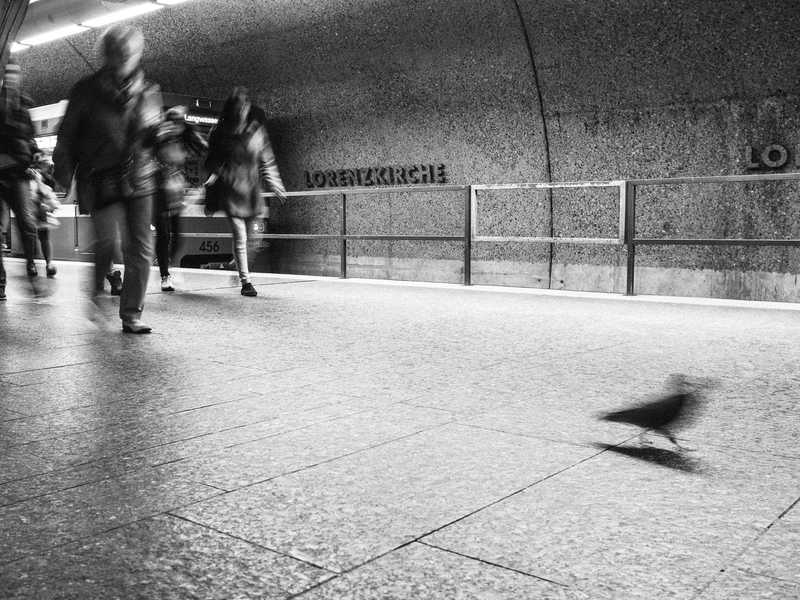 What amazed me was that bird (pigeon / dove / Taube) that was running around this underground platform.And by underground I mean real underground, as its two escalators through some tunnels to get back to the surface at Lorenzkirche Station. I saw the crazy bird and really wanted to capture it. Actually I had to wait through the arrival of two trains (10 minutes) until I got this shot where the bird seemingly heads the exodus procession of the arriving passengers. Also this shot was taken in the subway at “Hauptbahnhof” station. I got some serious looks from that girl as I was snapping away already before the train arrived. But I just smiled at her and she let it go. When the train finally came I got this shot where for me it all came together, the blurry ghost shape of the front of the first car and the way she’s illuminated at that moment. 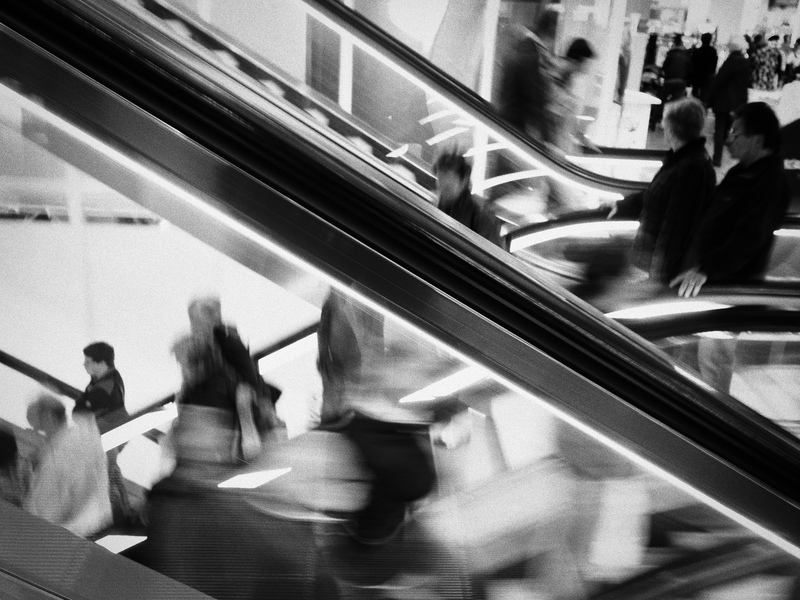 Next I went to the Karstadt Department Store with the idea about capturing movement on the escalators. I drove up and down at least 5 times, trying to get a decent shot. Obviously it depends what “traffic” you get on the parallel escalators. This was the shot I liked. There’s a hidden irony in this shot from the underground passage to Nuremberg’s Central Station. Directly behind me (you can see it from the small logo on the advertisement to the left) is a small MacDonalds fast food counter. 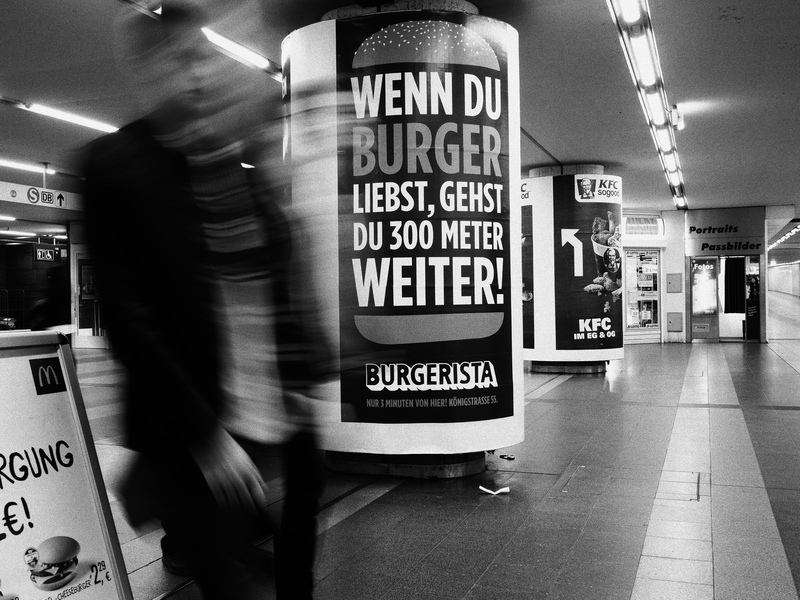 Directly in front of the eyes of the McD employees is this other huge advertisement from an outfit called “Burgerista” saying “if you love Burgers go 300 meters onwards”. I thought that is hilarious. Normally I don’t explain my pics (a pic should after all be self explanatory <lol>), but for the sake of my non-German speaking audience 😉 ….. So far some pics from my self-assignment. I also took some long exposure photos out of the windows of the train home, but as they are a complete different style I will show them in another post.